All children whose usual place of residence is within the geographic area defined below are entitled to enrol at Ngahinapouri Primary School. 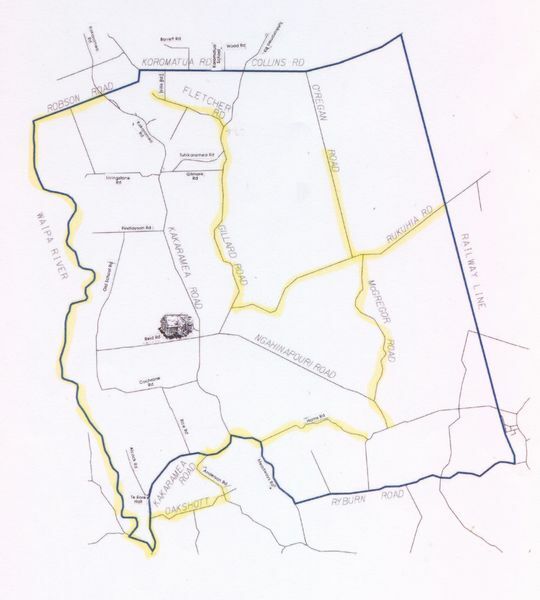 The boundary of the geographic is " Robson Road to Kakaramea Road, across to Fletcher Road, Fletcher Road, Gillard Road, Rukuhia Road to the Railway line, O'Regan Road to number 321, McGregor Road, Ham Road, Anderson Road to Oakshott Road, Oakshott Road, Waipa River. All addresses on both sides of the road are included. If there are more applicants in the second, third, fourth, or fifth priority groups than there are places available, selection within the priority group will be by a ballot conducted in accordance with instructions issued by the Secretary under Section 11G(1) of the Education Act 1989. Parents will be informed of the date of any ballot by notice in a daily or community newspaper circulating in the area served by the school.